Currently, 30 million Americans have osteoarthritis.1 Quality of life is diminished for individuals with osteoarthritis compared with those without it, and osteoarthritis constitutes a major cause of disability in the United States.2 The burden on the health care and financial systems increases as the prevalence of osteoarthritis increases. In 2003, the total cost of arthritis along with other rheumatic diseases topped $128 billion.3 Current nonoperative treatments are primarily palliative and unable to slow or reverse disease progression. Many patients resort to total joint replacement to improve function and reduce pain. Recently, nonoperative, biologic treatments have been developed to provide patients with a more durable symptomatic relief. The predominant orthobiologic treatments available include hyaluronic acid (HA), platelet-rich plasma (PRP), bone marrow aspirate concentrate (BMAC), and adipose-derived mesenchymal stem cells. The role of HA injections in the management of osteoarthritis is controversial. In 2013, the American Academy of Orthopaedic Surgeons released its clinical practice guidelines for osteoarthritis, stating that the use of HA in osteoarthritis is not supported.19 Notably, no stratification was performed on the outcomes based on the type of HA, which has since resulted in substantial controversy. The American Academy of Orthopaedic Surgeons' review of the literature found that although HA injections improved Western Ontario and McMaster Universities Osteoarthritis Index scores for pain, function, and stiffness, they failed to meet the clinically meaningful important difference.19 Despite this fact, HA is still widely used by orthopedic surgeons, especially for moderate osteoarthritis (Kellgren–Lawrence grade II–III) as described in a recent survey by Carlson et al.20 Since publication of the American Academy of Orthopaedic Surgeons guidelines in 2013, research has continued into the application of HA for knee osteoarthritis. In 2015, a systematic review by Campbell et al21 indicated that when compared with nonsteroidal anti-inflammatory drugs, corticosteroid, PRP, and placebo, HA had the highest level of evidence supporting its use for early osteoarthritis, showing improvements in function and pain for up to 26 weeks. Higher-level clinical research is needed to elucidate the effects of HA in early osteoarthritis. There is limited evidence for the use of HA injections in isolation for focal cartilage defects of the knee. However, recent studies have increased interest in the application of HA in combination with surgical microfracture for promoting chondrocyte proliferation and differentiation in vitro.22 Multiple animal studies have shown a positive effect of HA augmentation following microfracture through greater fill of defects and improved tissue quality.22,23 Recent clinical studies using microfracture in combination with HA augmentation have shown similarly promising results. Görmeli et al24 found that for patients treated with microfracture for osteochondral lesions of the talus, augmentation with HA improved American Orthopaedic Foot and Ankle Society outcome scores compared with those of the control group, and these scores were further improved when augmentation with PRP was used. A study by Gobbi and Whyte25 indicated superiority of a combined HA and BMAC injection with arthroscopic debridement but without microfracture compared with arthroscopic microfracture at 5 years postoperatively in patients with cartilage lesions of the knee. Additional investigations have described techniques using HA with BMAC as an adjunct to osteochondral grafting in high-grade cartilage lesions of the knee. These studies found the development of hyaline-like cartilage where the previous defect had been and improvement in pain and functional outcome scores when compared with baseline measurements.26,27 These studies indicate that HA may play an increasingly important role as an augment or scaffold in combination with other biologics for patients with focal cartilage defects. 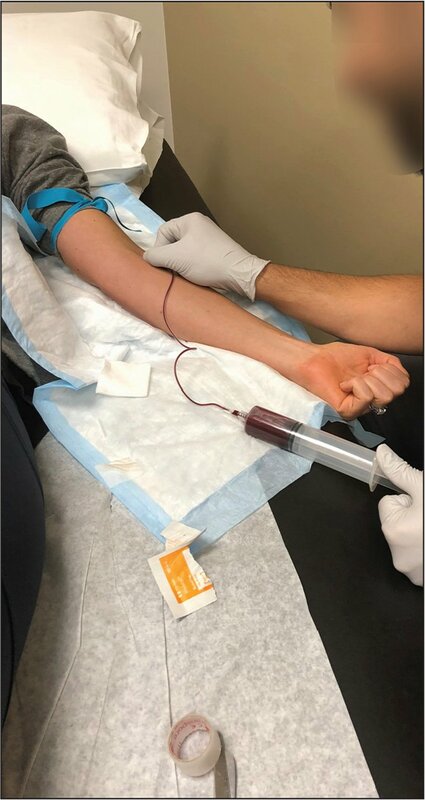 Clinical photograph showing a standard venipuncture for collecting whole blood used in platelet-rich plasma. Clinical photographs showing an injection of platelet-rich plasma under ultrasound guidance. The role of PRP for long-term pain relief for osteoarthritis remains controversial. Many orthopedic surgeons advocate the use of PRP injections to provide pain relief and functional improvements. A randomized, double-blind, placebo-controlled trial by Smith42 showed that 3 weekly PRP injections into the knee significantly improved total Western Ontario and McMaster Universities Osteoarthritis Index scores by 78% at 12 months, compared with a 7% improvement with saline injections. Similarly, a randomized, double-blind trial by Forogh et al43 compared a single PRP injection with a single corticosteroid injection in 41 patients with moderate knee osteoarthritis. They found that compared with corticosteroid, patients who received PRP had significantly greater pain relief and improved ability to perform activities of daily living and quality of life. Dai et al39 recently analyzed 10 randomized controlled trials with a total of 1069 patients comparing PRP with HA and saline injections for knee osteoarthritis. They found that at 12 months, patients receiving PRP injections had significantly improved Western Ontario and McMaster Universities Osteoarthritis Index pain and function scores compared with patients receiving saline injections. Further, these differences exceeded the minimum clinically important differences, defined as the minimum improvement that is deemed clinically significant by the patient.44 The study defined the minimum clinically important differences as an improvement in the Western Ontario and McMaster Universities Osteoarthritis Index pain score of 0.79 (scored 0–20) and the Western Ontario and McMaster Universities Osteoarthritis Index function score by 2.85 (scored 0–68). However, it was reported that 8 of 10 studies had a high risk of bias. Overall, the evidence suggests that PRP may have a role in the management of osteoarthritis and is a reasonable treatment for patients with failure of first-line treatments and who are not ready for arthroplasty. Common sources of mesenchymal stem cells include bone marrow, adipose tissue, muscle tissue, synovial tissue, amniotic fluid, umbilical cord, and placenta tissue. In osteoarthritis, bone marrow aspirate and adipose-derived mesenchymal stem cells are among the most commonly used biologic agents for the administration of progenitor cells. The role of BMAC in the management of osteoarthritis is still under investigation because little high-quality data are available. Chahla et al59 recently analyzed the outcomes of BMAC in knee osteoarthritis. They found that the available data are heterogeneous regarding the reported benefits of BMAC injections, with many studies showing good to excellent degrees of improvement in pain and function with minimal adverse reactions, although there were no randomized trials included at the time of this review. Conversely, recent studies by Kim et al60 and Shapiro et al61 comparing BMAC with saline injections for patients with bilateral knee osteoarthritis did not show a statistically significant difference in patient outcomes through 12 months. 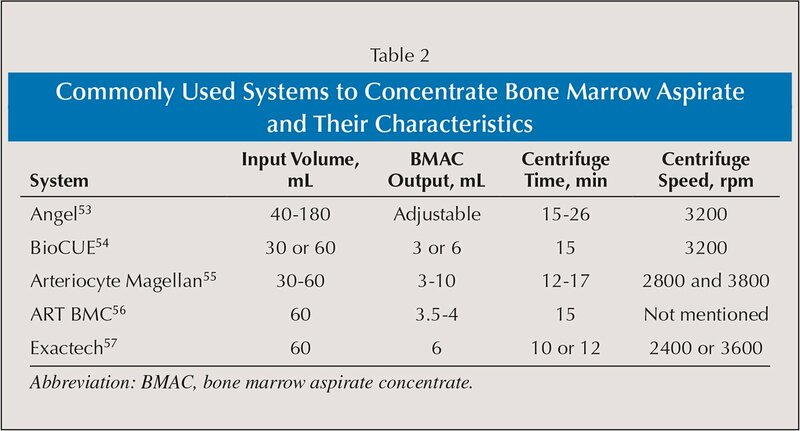 Bone marrow aspirate concentrate for the treatment of focal chondral defects, either to augment healing after microfracture or as a separate therapy, is showing encouraging early results. A study by Hannon et al62 found that, compared with microfracture alone, arthroscopic microfracture augmented with BMAC for talar osteochondral lesions led to improved outcome scores, overall outcome, and quality of repair tissue. As described earlier, Gobbi and Whyte25 found that a combination of HA and BMAC injections with arthroscopic debridement but without microfracture was superior to microfracture alone at 5 years postoperatively in patients with cartilage lesions of 0.5 to 2.2 cm2 in the knee. Adipose-derived mesenchymal stem cells are a form of minimally manipulated cell therapy used to treat a variety of orthopedic conditions. Adipose-derived products are of particular interest given their abundance of progenitor cells, with high concentrations of nucleated cells extracted per harvest.63,64 Adipose-derived mesenchymal stem cells are harvested via a lipoaspirate technique using subcutaneous fat65 (ie, from abdomen, flank, or buttocks) or arthroscopically from the infrapatellar fat pad.66 Once the adipose tissue is harvested, there are a variety of techniques available aimed at isolating the adipose-derived mesenchymal stem cells from the adipocytes and extracellular tissues. Although different processing systems use different techniques, the ultimate goal is to isolate the stromal vascular fraction, which is thought to contain the majority of the progenitor cells. Techniques for processing and isolating the stromal vascular fraction use microfragmentation and cleansing, vibrational energy, and/or enzymatic digestion, along with differential centrifugation to form the ultimate product. Of note, enzymatic processing of the adipose tissue, although used internationally, is not currently approved by the US Food and Drug Administration, as it falls beyond the classification of minimally manipulated. The final product is then typically placed into the joint via an intra-articular injection or otherwise arthroscopically. This process can be completed in the clinic or operating room and processed as a point of care therapy to be used during the same surgical anesthesia. Currently, no randomized, placebo-controlled clinical trials exist evaluating the use of stromal vascular fraction or adipose-derived mesenchymal stem cells in osteoarthritis. Phase I clinical trials have shown the safety of adipose-derived mesenchymal stem cells, with only minor local adverse effects.67 Russo et al68 investigated the effects of stromal vascular fraction on knee osteoarthritis in 30 patients. At 3-year follow-up, they reported improvements in clinical outcome scores when compared with baseline. A recent systematic review by Hurley et al69 evaluated the available clinical evidence on the use of adipose-derived mesenchymal stem cells in the treatment of osteoarthritis. Sixteen studies were included, which all showed improvement in clinical outcome scores when compared with baseline measurements. Notably, there was a 5% incidence of adverse reactions, consisting predominantly of pain and swelling. Overall, evidence has indicated that the use of adipose-derived mesenchymal stem cells and stromal vascular fraction is safe, with minimal adverse reactions. However, research supporting the use of adipose-derived mesenchymal stem cells and stromal vascular fraction in osteoarthritis is limited to small studies and case series. Further large clinical trials are needed to better elucidate the role of adipose-derived mesenchymal stem cells and stromal vascular fraction in osteoarthritis. Limited evidence exists regarding the use of adipose-derived mesenchymal stem cells as an adjunctive treatment for focal cartilage defects. A study by Koh et al70 explored the role of adipose-derived mesenchymal stem cell injections in combination with microfracture in 80 patients with focal defects of 3 cm2 or larger. At 2-year follow-up, they reported improved magnetic resonance imaging appearance of the lesions in the cohort treated with microfracture and adipose-derived mesenchymal stem cells when compared with the cohort treated with only microfracture. Importantly, their study failed to show any difference in outcome scores or tissue quality during second-look arthroscopy. Certainly, additional work examining the role of adipose-derived mesenchymal stem cells and stromal vascular fraction therapy in the treatment of focal cartilage defects is warranted. Overall, given the lack of high-level evidence, the role of biologics in the treatment of both osteoarthritis and focal cartilage defects remains controversial. However, most studies examining the use of biologics have reported a good safety profile without significant adverse effects. The available research regarding the use of biologics for focal cartilage defects holds promise and appears to support augmenting traditional microfracture surgery with biologics to improve tissue healing, cartilage quality, and clinical outcomes. As pressure increases for physicians to find alternative, minimally invasive techniques to combat osteoarthritis and focal defects, the role of biologics seems posed to expand. Further research is needed to elucidate the role biologics should play in the management of focal and diffuse articular cartilage disease, including the type, frequency, and amount of product needed for a given clinical condition. Centers for Disease Control and Prevention. Osteoarthritis (OA). http://www.cdc.gov/arthritis/basics/osteoarthritis.htm. Accessed October 9, 2018. Centers for Disease Control and Prevention. National and state medical expenditures and lost earnings attributable to arthritis and other rheumatic conditions—United States, 2003. MMWR Morb Mortal Wkly Rep. 2007;56(1):4–7. Euflexxa [package insert]. Parsippany, NJ: Ferring Pharmaceuticals Inc; 2016. Synvisc [package insert]. Ridgefield, NJ: Genzyme Corp; 2014. Synvisc-One [package insert]. Ridgefield, NJ: Genzyme Corp; 2014. Supartz [package insert]. Durham, NC: Bioventus LLC; 2015. Durolane [package insert]. Durham, NC: Bioventus LLC; 2015. Hyalgan [package insert]. Parsippany, NJ: Fidia Pharma USA Inc; 2014. Orthovisc [package insert]. Woburn, MA: Anika Therapeutics; 2005. Gigis I, Fotiadis E, Nenopoulos A, Tsitas K, Hatzokos I. 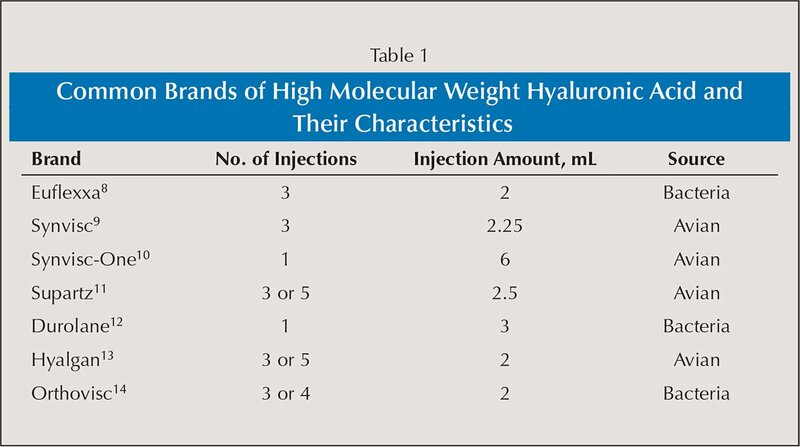 Comparison of two different molecular weight intra-articular injections of hyaluronic acid for the treatment of knee osteoarthritis. Hippokratia. 2016;20(1):26–31. Forogh B, Mianehsaz E, Shoaee S, Ahadi T, Raissi GR, Sajadi S. Effect of single injection of platelet-rich plasma in comparison with corticosteroid on knee osteoarthritis: a double-blind randomized clinical trial. J Sports Med Phys Fitness. 2016;56(7–8):901–908. Papalia R, Diaz Balzani L, Torre G, et al. Intraoperative application platelet rich fibrin, postoperative injections of PRP or microfracture only for osteochondral lesions of the knee: a five-year retrospective evaluation. J Biol Regul Homeost Agents. 2016;30(4)(suppl 1):41–49. Simmons PJ, Torok-Storb B. Identification of stromal cell precursors in human bone marrow by a novel monoclonal antibody, STRO-1. Blood. 1991;78(1):55–62. Angel cPRP & Bone Marrow Processing System [package insert]. Naples, FL: Arthrex; 2018. BioCUE Platelet Concentration System [package insert]. Warsaw, IN: Biomet Orthopedics; 2011. Magellan Autologous Platelet Separator System including associated disposables [operator's manual]. Hopkinton, MA: Arteriocyte Medical Systems, Inc; 2018. ART BMC [package insert]. Austin, TX: Celling Biosciences; 2014. Biologics Preparation Technique [product manual]. Gainesville, FL: Exactech Biologics; 2012. Chahla J, Dean CS, Moatshe G, Pascual-Garrido C, Serra Cruz R, LaPrade RF. Concentrated bone marrow aspirate for the treatment of chondral injuries and osteoarthritis of the knee: a systematic review of outcomes. Orthop J Sports Med. 2016;4(1):2325967115625481. The authors are from Riverside University Health System (BJS), Moreno Valley, California; Rush University Medical Center (JC), Chicago, Illinois; and the University of Colorado School of Medicine (JG, RMF), Boulder, Colorado. Correspondence should be addressed to: Rachel M. Frank, MD, University of Colorado School of Medicine, 12631 E 17th Ave, Mail Stop B202, Aurora, CO 80045 ( Rachel.frank@ucdenver.edu).